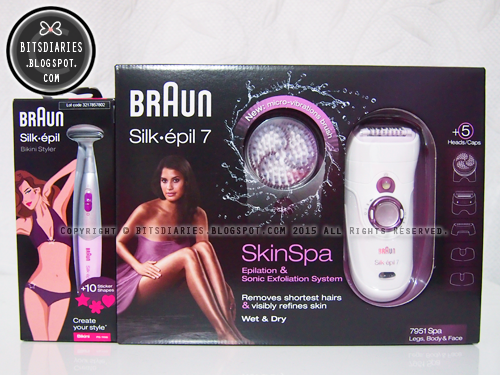 It has two speed settings, [I] for gentle epilation and [II] for efficient epilation, and a smart light which provides better visibility of fine hairs, so that none are missed during epilation. There are 40 close-grip tweezers on the barrel that pull out hair by the root and remove hair as short as 0.5mm! Up to 4x shorter than wax can catch! The device comes with these massage rollers with a pivoting head for a perfect adaption to all your body contours, while actively stimulates your skin for an extra gentle epilation. It can be detachable by the way. 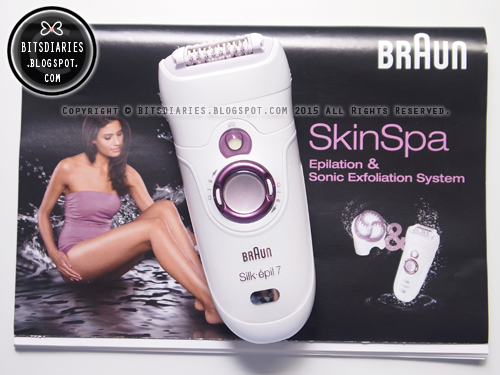 It also comes with different caps to achieve an efficient and effective epilation on different areas like the face, body and even sensitive areas like underarms, bikini line etc..
As mentioned earlier, it features a sonic exfoliation brush that works 4x better than a manual scrub alone. The high density brush is made of 10000 fine bristles; and with the sonic technology, it gently buffs away dead dull skin cells with massaging more than 3000 micro-vibrations, naturally improving skin's appearance by regenerating the skin surface and brings out the skin's natural glow! Here's a picture of the exfoliation attachments. Apart from that, it also comes with a cleaning brush and a white pouch as shown in the following picture. A full view on the device with all the attachments and tools. 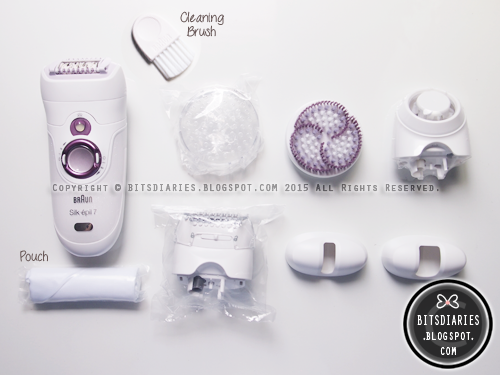 All the attachments, except the shaver head, can be used and cleaned under running water. The caps can be easily detached and attached to the device without any fuss. Simply pull the cap out to detach from device. For attachment, each cap has an arrow embossed on it to guide you on that. You just have to match the arrow on the cap to the arrow embossed on the device as shown in the next picture. You will hear a 'click' sound once it has been attached. Unlike the epilation caps, the removal of exfoliation brush adaptor and shaver head is slightly different. 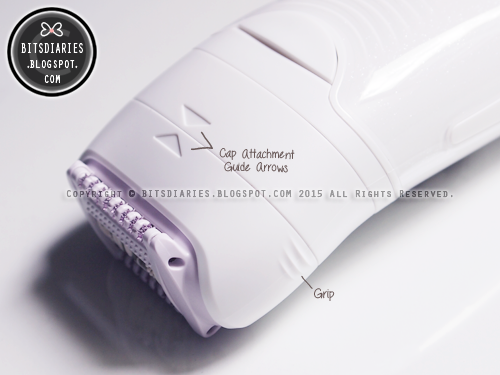 Before attaching the exfoliation brush adaptor or shaver head, you need to press the button at the back of the device to detach the epilation head (Refers to the following picture). 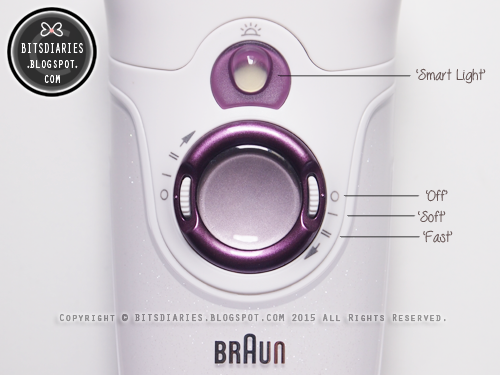 Then, you can just attach the exfoliation brush adaptor or shaver head to the device without pressing the button. Sorry no picture for the attachment. Anyway, similar to the attachment of cap, you should hear a 'click' sound once it has been attached. It lasts up to 40 minutes cord-less operation time on a full charge. 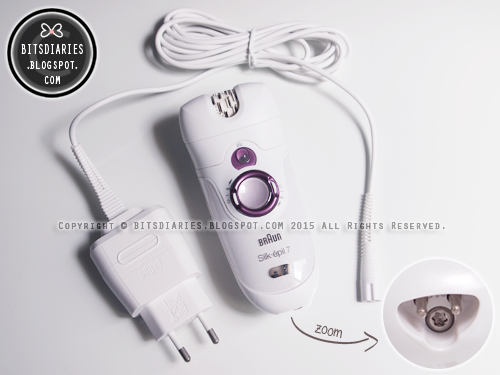 Once fully charged, turn it on and let it works it's magic on your skin! Before I owned an epilator, I used razor and tweezer and they are economic and affordable hair removal tools. Kick aside those salon's services that charge money to help remove hairs; I will only be sharing my own experience on underarms shaving and epilation with razor, tweezer and epilator. So for razor, it is rather easy hair removal method as all I have do is to glide it on the surface of my skin and it takes less than a minute to shave long hair to short. However, the skin will left with noticeably black little spots of hairs that are rooted in the skin pores, which the razor could not catch. Another downside of shaving using a razor is the hairs usually grow back fast and they will grow out thicker and coarser, which you know, it isn't a good thing la. For that reason, I normally use tweezer because instead of shaving the hairs, it plucks them out like an epilator. So it will not have black little spots or thicker, coarser hair issues. BUT, I have to say, it is a really tiring task to remove hairs using a tweezer. Gosh, I have to put up my arm, tilt my head, eyeballs roll down close to the corner and stay at that position, focus, aim and try to pluck each and every strand of hairs out. Usually when I'm done with one side, I feel exhausted to do the other side. But of course, I still did both la! lol. By the time I have done both sides, my arms and neck were aching and my eyes became (x_x)... I always feel weary whenever the hair grows back. It may be a very effective way to remove hairs but it can be very tiring and time consuming! 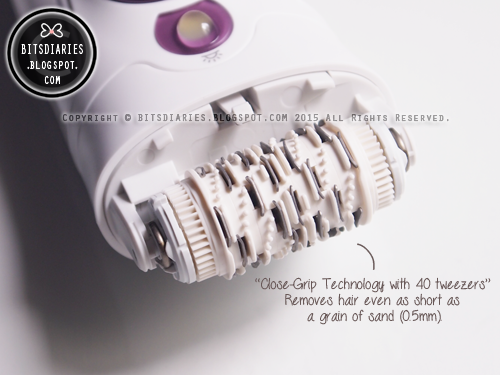 Now with this epilator, it makes hair removal task a piece of cake! 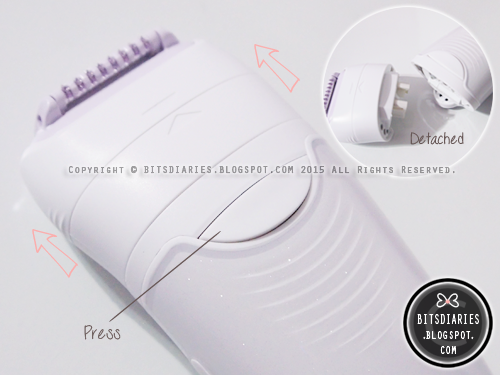 Unlike razor, an epilator plucks and removes hairs by the roots like a tweezer. It epilates hair faster than the tweezer and is more super convenient and time-saving as well! 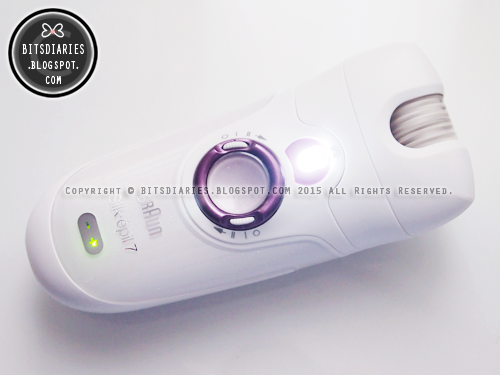 I just have to turn it on, glide back and forth once or twice on my skin and voila!, clean underarms within seconds! Frankly speaking, I never have thought hair removal can be that fast and easy! Furthermore, it comes with sonic exfoliation feature that exfoliate better than a manual scrub, leaving my skin smoother and brighter-looking~ Once you have felt the effect of exfoliation with Silk Epil 7 SkinSpa on your skin, you will never want to miss it again. - Well, it may feel tingly painful, especially during the first try. But no worries, it's not extremely painful to the point that makes you tear up. The pain is pretty bearable and will be gone fast. Once you get used to it, it won't be a big issue anymore. 2) Will there be any redness and soreness? - Yes, there is. However, it is normal to experience some redness and soreness, especially during the first try. Again, no worries, everything will be fine very soon. 3) Can it be shared? 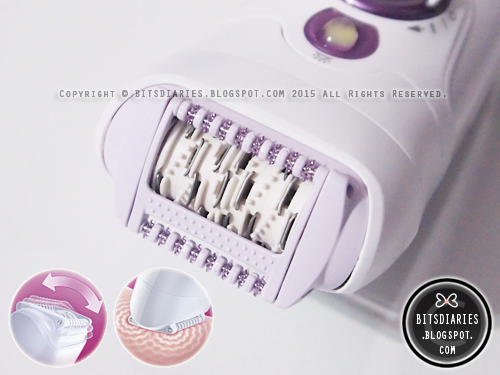 For hygienic reasons, it is not recommended to share epilator with anyone. If you do so, you have to make sure you clean and sanitize it well. 4) How much does this costs and where can I get this? For this model (Silk Epil 7 SkinSpa 7951), it costs SGD$219 in Singapore. You can find it in stores that sell electronic appliances like Courts, Harvey Normans etc.